Just a breath away from the ocean... Nicely decorated and appointed. The home features two fireplaces. Beautiful beach. Pets are NOT allowed, No Smoking. Please disregard the negative review written in 2014. Unlike the review, all windows have coverings. We also have plates, cups, cooking utensils, pots and pans, quality flatwares (not plastic), and WiFi . Also, please be assured that the house is cleaned immaculately by a professional cleaning crew. Please note that the reviewer who wrote in 2014 depicted some false accusations including comment about the odor which was not true. Also, furnitures were updated in December 2015 with brand new sectional sofa in the living room. You have access to huge deck (about 400 sq. ft) next to the kitchen where you can BBQ and dine outdoors. Rooftop deck and a small balcony next to the living room are not part of the rental at this time. 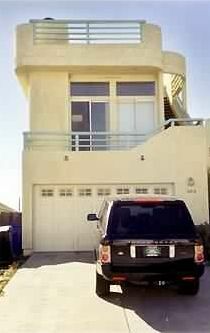 House is in Oceano residential beach area steps from the sand. It is located few steps from the Pismo State Beach and it's very close to the sand dunes. We were so excited to go away with our daughter, son-in-law and our 4 grandchildren. Unfortunately the house was not maintained well at all. The coast does take its toll on homes, but this was ridiculous. The trash was overflowing on the side of the house when we arrived, that explained the army of ants that resided mainly in the kitchen and on the peripheral areas. After cleaning the kitchen, putting the groceries into a refrigerator that has no front to any of the drawers or door shelves, we just decided to make the best of it. But when we came to all the negative notes taped everywhere about not using this or that piece of furniture it was just too much. Then more than half the light bulbs were burned out, broken deck chairs, no cable (screen said to call the provider! ), bottom dishwasher rack has no wheels, rancid oil found in cupboard (more ants), says it sleeps 8 but the "roll-out" couch is in the dining room with no room to unfold! The dining room table has unstable legs. No top deck because it's unsafe due to lack of maintenance. There was no welcome or information booklet. This house needs some serious TLC, and major maintenance - it's just the cost of owning a rental property. We have stayed at 10+ beach houses on the coast of California but have never experienced anything like this. Not a true presentation of what you will get with this house. This house should be condemned! Hoping you will print this true review - we would not have rented it if we knew the truth. We really just needed somewhere to sleep since we knew we where going to be out at the car show in Santa Maria all weekend but it was great. Clean and worked for our group. The property manager is super nice. I thought it was a little odd that a good amount of items had labeles saying do not use, I think if the owner doesn’t want people touching they shouldn’t have it in the property but that’s beside the point. Overall great house would consider renting again for next years trip back south for The Santa Maria Cruise and Car show we love to come down for. It is very easy to walk down the street to the beach. Can BBQ on the beach and camp fire at night. Located right by the beach! I really appreciate your great review. It's a nice clean place near the beach, and has a large balcony with outdoor seating. We were few friends who traveled together and we all enjoyed our stay here. - Thank you. Note: There's no toiletries in the bathroom, so please make sure to bring some. In the kitchen, there's plenty of utensils, but if you need to bring your own sugar, coffee, tea, etc. to cook or make anything. Cancellation policy: no refund under any circumstances.